ItemI-52597 - "Sketch-view of proposed development at Seton Lake, Bridge River Power Company". ItemI-52598 - "The Granby Consolidated Mining and Smelting Co. at Anyox". ItemI-52603 - "Brenda Falls at the outlet of Sugar Lake, site for storage dam, Shuswap River"
ItemI-52602 - "Sugar Lake from the west shore, Shuswap River". ItemI-52601 - "Dawson Falls on the Murtle River at Lot 3208". ItemI-52600 - "Elk Falls, Campbell River Falls, Vancouver Island Power Co. possible 70,000 continuous horse-power". ItemI-52599 - "Sugar Lake from the north shore, Shuswap River". ItemI-52617 - "Canoe transport on the Sarita River, near Alberni, Vancouver Island". ItemI-52347 - "Peachland, looking south from Peachland, Squally Point in middle distance". 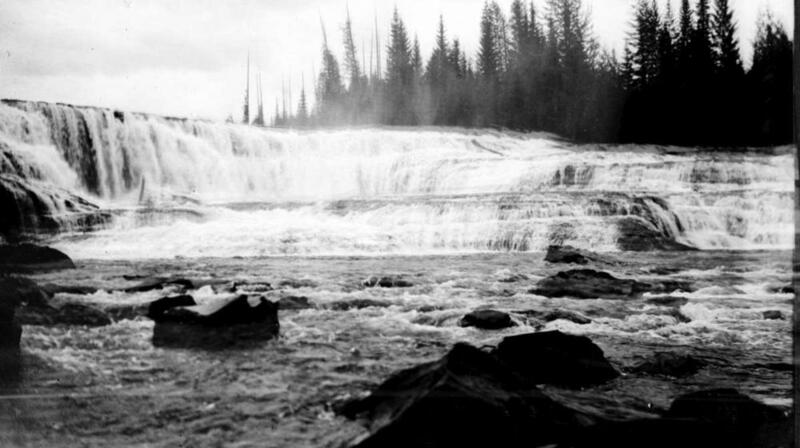 Item I-52601 - "Dawson Falls on the Murtle River at Lot 3208". "Dawson Falls on the Murtle River at Lot 3208".